The actuator consists of a scotch yoke mechanism which is fully enclosed. The scotch yoke mechanism allows the M-Series actuator to provide a torque curve matching the torque requirements of the valve. The thread system of the traveling nut is self-locking, maintaining disc position under varying flow conditions. The M-Series is available with either a position indicator standard weatherproof design or can be purchased in a buriable option. 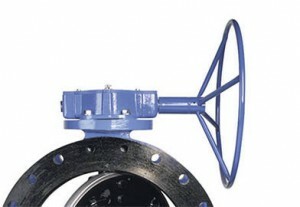 As sized on BAW butterfly valves, the actuator requires a rim pull of 80 pounds or less on the hand wheel or chain wheel; with a 2″ (50mm) nut, the input torque requirement is 150 foot pounds or less. Optional extension accessories are available.